There are actually four levels (yes 4) to the new layout. The first level, or better called the lower level, is the hidden storage tracks. This consists of a long grade running down to and below the Durango yard. Where there is a big balloon loop and passing siding. Plus three long spurs for trains. And multiple tracks to part locomotives on. This level is not drawn in detail on any plan here, other than the connection on the back side of Rockwood. The second level is the main level, which includes the town and yard of Durango, the switching area of Rockwood, the "Highline" over the foyer on the wall, and a pass thru track in the Silverton room (where there are 3 long storage spurs.) The second level is "dual gauge", with Gn3 as the main track, but also Gauge 3 track for a standard gauge train to run, with some switching. 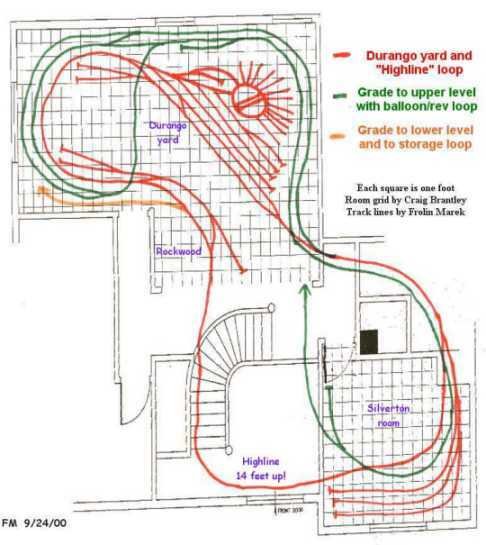 The third level is actually the grade, running from the connection on the right side of the yard, along the back wall in a tunnel, around a loop with reverse connection, up the back wall further and thru the Silverton room. The final leg of this grade, uses a "gauntlet" track sharing a shelf with the upper level loop, and the grade connects with the upper level, at the Lobato/Ophir Wye. 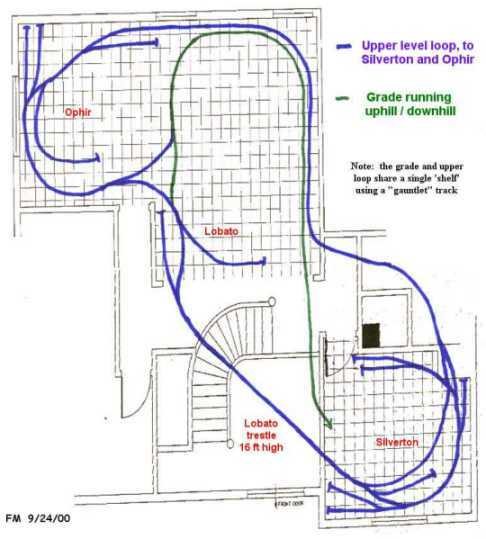 The fourth level is the highest loop around the layout, which runs thru the towns of Silverton, Lobato and Ophir. The highlight of this section will be the 15 foot long "Lobato Bridge" (modeled after the real thing on the Cumbres & Toltec Scenic RR). This bridge will cross the foyer at about 16 feet off the floor.